1. If boot system commands have been configured, which of the following could happen if a router fails to obtain an IOS image from the primary sources during bootup? The router will load a subset of a full IOS version from system ROM. The router will attempt to reboot two times before failing. The router will load the last good IOS image from NVRAM. The administrator will be prompted to load a valid IOS image. 2. Which command is used to change the order in which the router looks for system bootstrap information? Pings between Atlanta and Dallas are successful. If a hostname table or DNS connection is not available, which command will successfully establish a remote connection from Atlanta to Dallas via Telnet? 2. Which command sequence will permit access to all five router virtual terminal lines with a password of cisco? 1. Which keystrokes can be used to return to the privileged mode from the interface configuration mode? 2. 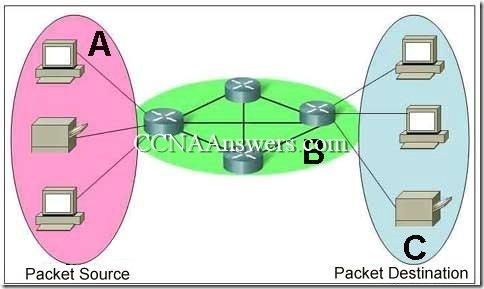 Which connection method can be used to perform the initial configuration of a router? 1. When a network administrator applies the subnet mask 255.255.255.248 to a Class A address, for any given subnet, how many IP addresses are available to be assigned to devices? 2. What is the maximum distance that 10BASE-T will transmit data before signal attenuation affects the data delivery? 1. 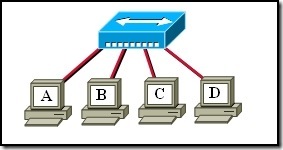 A router determines the path to deliver a packet. What layer of the OSI model does this fact represent? Refer to the exhibit. A network administrator has configured a network after subnetting the network number 192.168.0.0/28. Workstation 1 is not able to communicate with Workstation 2. What is the cause of this loss in communications? 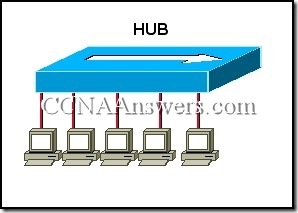 Workstation 1 and Workstation 2 are on the same subnet. The serial connections are using addresses from the LAN subnets. 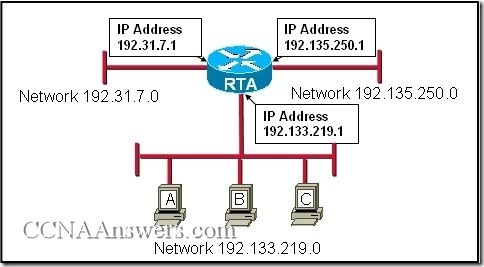 If routers are used in the network, IP addresses do not need to be subnetted. 1. Which layer of the OSI model can provide a connection-oriented, reliable data transfer between two hosts? 2. Which protocol is used to transfer files from computer to computer but is considered connectionless? 1. How does a router decide where the contents of a received frame should be forwarded? 2. Which device would add security to a network by not forwarding broadcasts? The LAN segment is subnetted to allow 254 subnets. The DNS server for this host is on the same subnet as the host. The host automatically obtained the IP addresses 192.168.1.100. 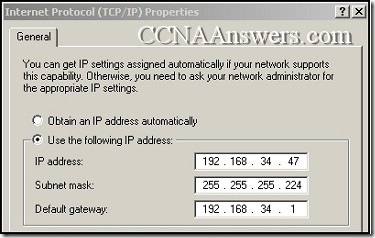 The host received the IP address from a DHCP-enabled device on the local LAN segment. 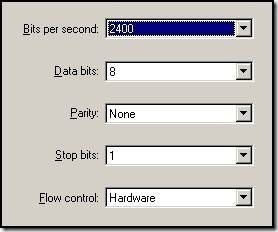 The host is assigned an address of 00-50-8D-F1-EA-8D by the administrator. Refer to the exhibit. The small office LAN shown in the exhibit may eventually be connected to the Internet. 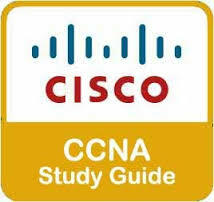 According to Cisco best practice, which IP network addresses should be used?